Make you and your partner happier with fresher morning breath when you first wake up. The bad breath occurs because your saliva dries up during sleep. This allows bacteria to build up and produce foul smells. Remain calm! Remedies exist to reduce and eliminate the odor. Ok, we get it. You want to get rid of your toxic morning breath after a good night’s rest. Why do you wake up with it? Science tells us many bodily functions stop or slow down in our sleep. This includes our glands that produce saliva. Saliva plays a key role in combating bad breath. High amounts of oxygen exist in saliva, which kills anaerobic bacteria. Additionally, saliva helps clear away food particles in your mouth that fuel the odor-producing bacteria. 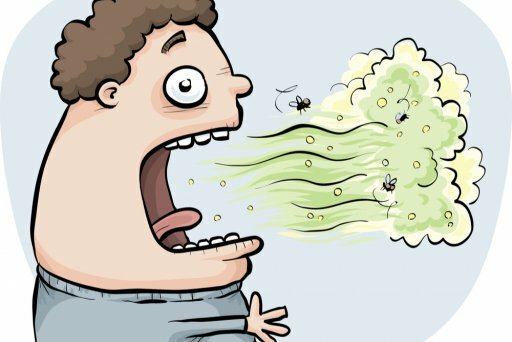 Combined with less saliva, the bacteria rapidly multiplies and creates stinky breath. Snoring or breathing through your mouth while sleeping means even worse morning breath will plague you. Mouth dryness remains the leading cause of bad breath. Note that if you eliminate all dental-related causes and still have bad breath, then we suggest you make an appointment to see a physician. Of course, exercising a good dental routine before you fall asleep is the best way to make your morning breath more fresh and clean. Brushing, flossing, gargling mouthwash and cleaning your tongue properly removes most food particles that help to generate bacteria in your mouth. Did you know about 85 percent of your bad breath comes from the back of your tongue? Stick out your tongue to view the white or brown coating at the back. That’s where bacteria hangs out and generates volatile sulfur compounds (VSCs). Hydrogen sulfide and methyl mercaptan are the primary bad smelling compounds. That’s why Dr. Lauren at Orange Beach Family Dentistry and other dental experts recommend that before bed you place a tongue scraper at the back of the tongue and pull it forward to clean it. Many brands exist. Find a scraper that you like best that helps in eliminating sour morning breath. Various dry mouth products exist, too. These increase the flow of saliva and some can even stay in your mouth overnight while you sleep. If you do wake up in the middle of the night, be sure to swish some water around in your mouth. Another helpful tool in the morning breath battle: gargle baking soda before going to bed. This creates an alkaline environment in your mouth that helps kill bacteria. Use a teaspoon of baking soda in one cup of water and gargle it for one minute. It’s safe to go ahead and swallow some of the solution to coat your throat. Most importantly, to remain effective, do not rinse your mouth after doing this. New research suggests oral probiotics — known primarily for promoting healthy digestion — can lead to improved dental hygiene. Oral probiotics are good bacteria that fight back the amount of bad bacteria. Additionally, findings indicate other benefits to the health of your mouth, such as teeth whitening and reducing bleeding of your gums. Orange Beach Family Dentistry Takes Care of All of Your Dental Needs and More! If you have any questions about bad morning breath or other dental issues, ask our friendly team members at Orange Beach Family Dentistry. Call us today to schedule an appointment for your regular cleaning or other dental needs! We will make your experience as pleasant and stress-free as possible.